Brief Synopsis – A 12 year old makes a wish to be big and it somehow comes true. My Take on it – We all dreamed a skids of what it will be like to be an adult and this movie does a great job of showing that. I saw this movie when I was 14 and can only really fully appreciate it now as a 39 year old. Watching a young Tom Hanks in his first role to get him a Best Actor nomination was a pleasure, he really found a way at the age of 30 to act like a 12 year old and make it seem real. Great supporting roles by Robert Loggia and Elizabeth Perkins. I watched the Director’s Cut of this movie which is 30 minutes longer than the original cut and felt that it really gives the movie more weight; adding a completeness that was missing from the original cut. The DC adds more depth to the main character by showing more of his life as a kid and more of his life as an adult. 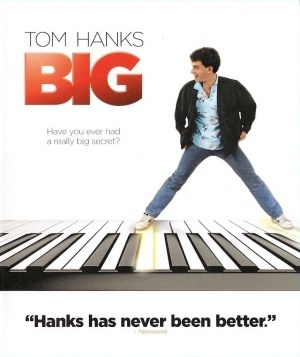 Best scene in this movie is most definitely the piano scene between Loggia and Hanks!! Bottom Line – This movie really hits the nail on the head. Hanks shines and makes us believe that he really is a 12 year old in the body of a 30 year old. Highly recommended!